Habit: Tree, shrub, [woody vine]. Leaf: opposite [alternate], generally palmately or ternately [pinnately] lobed to compound, deciduous, petioled; stipules 0. Inflorescence: umbel, panicle, or pendent raceme, axillary or terminal. Flower: unisexual or bisexual, radial or +- bilateral; sepals (4)5, free or fused; petals 0, 4, or 5(6); prominent disk between petals and stamens; stamens 5--12, free; ovary superior, chambers 2--3, each 2-ovuled, style short or 0, stigmas 2(3), linear, or 1, unlobed. Fruit: 2(3) 1-seeded mericarps, conspicuously winged, or generally leathery, generally 1[many]-seeded capsule [berry, nut, drupe]. Genera In Family: 150 genera, 1500 species: +- worldwide. Note: Acer traditionally placed in Aceraceae, Aesculus in Hippocastanaceae. Cupaniopsis anacardioides (A. Rich.) Radlk. possibly naturalizing in southern California. Unabridged Note: Acer and Aesculus have traditionally been placed in small families (Aceraceae and Hippocastanaceae, respectively). However, virtually all the traits considered characteristic of these two small families are also found in the closely related large family Sapindaceae, and it seems more reasonable to emphasize the close relationship of the whole group by treating it as a single family, rather than maintaining two small segregate families that differ from Sapindaceae in virtually nothing except opposite leaves (Harrington et al. 2005). Habit: Shrub, tree; occasionally monoecious. Inflorescence: umbel, panicle, or pendent raceme. Species In Genus: +- 130 species: northern hemisphere. 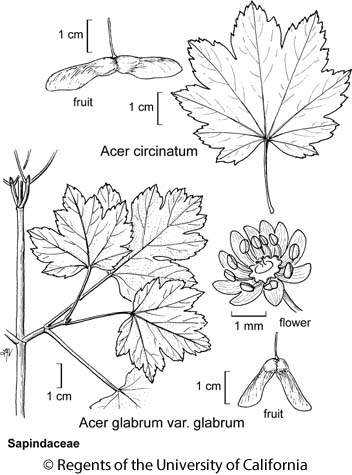 Etymology: (Latin name for Acer campestre) Note: Many species monoecious or dioecious. Unabridged Note: The sexuality of Acer species is complex, with some species described as dioecious or monoecious and many species described as having both unisexual and bisexual flowers on the same tree. However, maple flowers that appear morphologically bisexual may be functionally unisexual, producing functional pollen or ovules but not both. More study of sexuality is needed in our native maples. In some Acer species, fruit may become fully developed even if no seed is set, so that production of morphologically normal fruit is no proof that a plant is reproducing. Habit: Shrub, small tree, 1--6 m, branches generally sprawling, occasionally rooting. Leaf: 5.5--9 cm, 7--13 cm wide, 7--9-lobed for 1/4--1/2 of leaf length, lobes sharply toothed, abaxially pale green, glabrous to long-hairy at least on leaf base, major veins. Inflorescence: terminal, ascending, flowers 6--22, appearing after leaves. Flower: petals 1--3 mm, << sepals. Fruit: wings spreading 160--210°. Citation for this treatment: Alan T. Whittemore 2012, Acer circinatum, in Jepson Flora Project (eds.) Jepson eFlora, http://ucjeps.berkeley.edu/eflora/eflora_display.php?tid=11733, accessed on April 22, 2019.
n&c NW, CaRH, n SN; Markers link to CCH specimen records. Yellow markers indicate records that may provide evidence for eFlora range revision or may have georeferencing or identification issues. Purple markers indicate specimens collected from a garden, greenhouse, or other non-wild location.